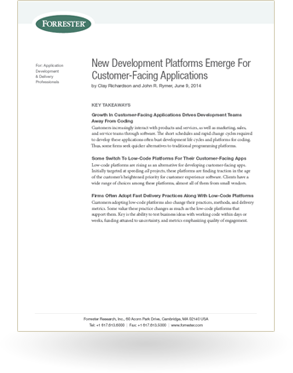 According to a recent June 2014 Forrester Research, Inc. report entitled “New Development Platforms Emerge For Customer-Facing Applications,” many companies are choosing low-code platforms over traditional programming platforms due to the speed with which low-code apps can be assembled and tested. With customer-facing applications on the rise, traditional programming platforms for business process and dynamic case management and content management simply cannot keep up with the “short schedules and rapid change cycles” required to develop these applications. Learn about the advantages that low-code platforms give companies, including the ability to lower barriers between requirements and delivery and provide business leaders with a way to test and experiment with new ideas at a low risk and cost. Download the full Forrester report at no cost to learn more about the benefits that low-code platforms provide and what this means for the future of companies looking to implement these platforms.